People who visit France, tend to pick up these staples without fully understanding what are they meant for. I’m starting a series of Demystifying the French Pharmacy Cult Products. 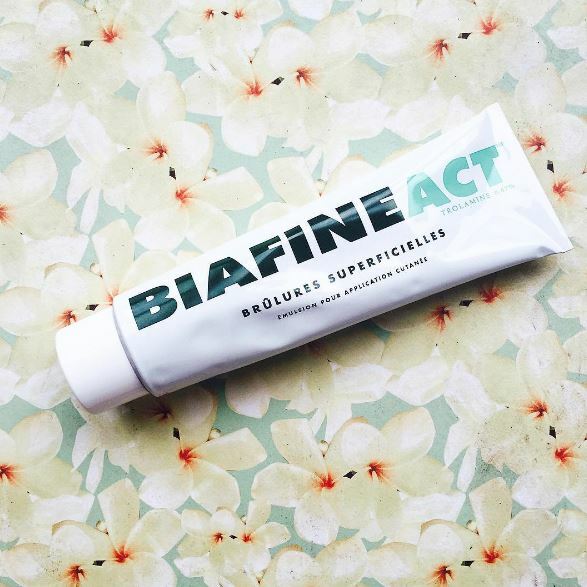 “Biafine is a topical, water-based emulsion that helps damaged skin heal and helps manage wounds, burns, and other skin abrasions. It is used for the dressing and management of wounds, pressure sores, leg ulcers, 1st and 2nd degree burns including sunburns, donor and graft sites, skin reactions to radiation therapy, minor scrapes”. Basically for healing the skin. I’ve used this to heal my recent kitchen mishap (burnt my hand while pulling the baking tray out of 390degreeF oven), cracked heels, extreme dry flaky skin after shaving my legs, and I can safely say it has worked like a charm. The primary ingredient attributed to healing is Squalene and Trolamine. I’ve heard other bloggers suggesting to use on face as night cream etc. however I would personally NOT use on the face as it has Liquid Paraffin listed as second ingredient after purified water. If you love mineral oil and have no qualms using on face then you’re golden. But if you’re like me when it comes to Mineral Oil, Biafine is best for body skin. Yes I have no problem using mineral oil on my body skin.